His remarks follow the citations of the military personnel and experts who say that the current ROK air fighters are short of numbers and operation radius to fly to the Ieodo. The only available kinds of F-15 or KF-16 can saty on the sky of the Iedo only for 20 minutes, they say. The article is above all on the need of strengthening ROK air force; additional purchase of advanced fighters, introduction of air oil feeders, and base-building. 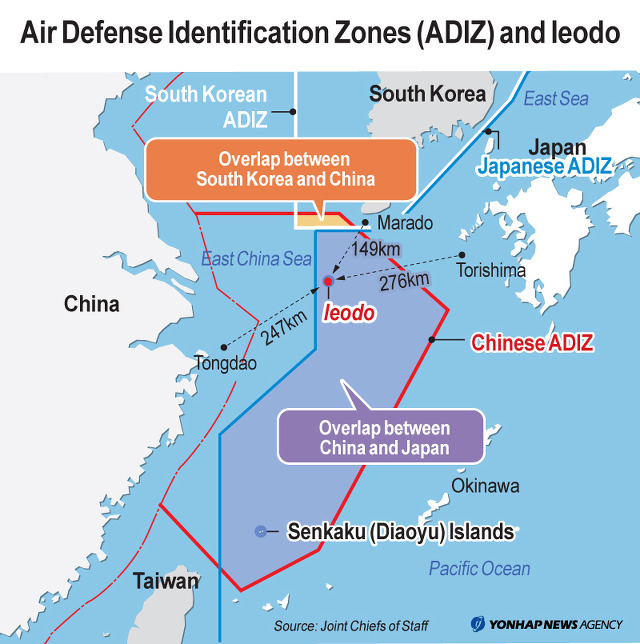 The whole argument occurs with the need of including the Ieodo in the Korean Air Defense Identification Zone, since the China declaration on her ADIZ (Air Defense Identification Zone) on Nov. 23 in which she put the Ieodo, as well as the Senkaku(Dayou) Islands. Recently on Nov. 27, the South Korea Ministry of National Defense decided to purchase four air oil feeders from 2017 to 2019. The operation time would be extended to one hour then. Boeing KC-767 is one of the candidates. See the article here. Korea has set up a maritime science research center on the rock, considering it as her own district sea area, despite the fact that a rock cannot be regarded as an element for territorial waters. The issue has lied on not territory but on the EEZ (Exclusive economic Zone).Anyway, because the Ieodo is put in the JDAIZ, Korea has made requests to Japan whenever she needed to fly to the Ieodo. Now with the China’s claim on her ADIZ on Nov. 23, the Ieodo is fated to be put between the overlapped ADIZs of Japan and China. The South Korean government is currently attempting to put the Ieodo in her ADIZ, though late. See theYonhap News article on Nov. 29. To consider together of the currently disputed air defense identification zone and the Jeju naval base, one may remember the remarks on Oct. 18, 2012 by Kim Jae-Yoon, a member of the National defense Committee of the National Assembly and a member of the Jeju-based Democratic Party. He claimed in the National Assembly inspection on the ROK navy headquarter at the time, that “the cause that the Jeju naval base is necessary for the protection of south sea area is suspected to be merely a show.” He said the reason, “it is because the navy’s operation in the south sea area would be limited by the JADIZ (Japanese Air Defense Identification Zone), even though the navy has stated that the purpose to build the Jeju naval base lies in effective supervision and protection on the south sea area and sea lane.’ Kim pointed out that:‘While the Korea Air Defense Identification Zone( KADIZ) is set close to the Jeju island, the Japanese Air Defense Identification Zone (JADIZ) is set below the south sea of the Jeju and the Ieodo also belongs to the JADIZ.’ For more on this, see here. His remark was, in fact, very likely to be much helped by the resource collected by the Gangjeong Village Association who prepared in September, 2011, for the national Assembly inquiry. The current dispute on the air defense identification zone refreshingly reminds also that Korean military is subordinating to the United States and Japan military under the name of the ROK-US-Japan trilateral alliance. It also stresses not only that Korea, especially Jeju has to wisely maintain its balance sense amidt the conflict between the United States/ Japan and China but also in the critical role to contribute to the peace of the north east Asia. The weakest has the key, you might say. 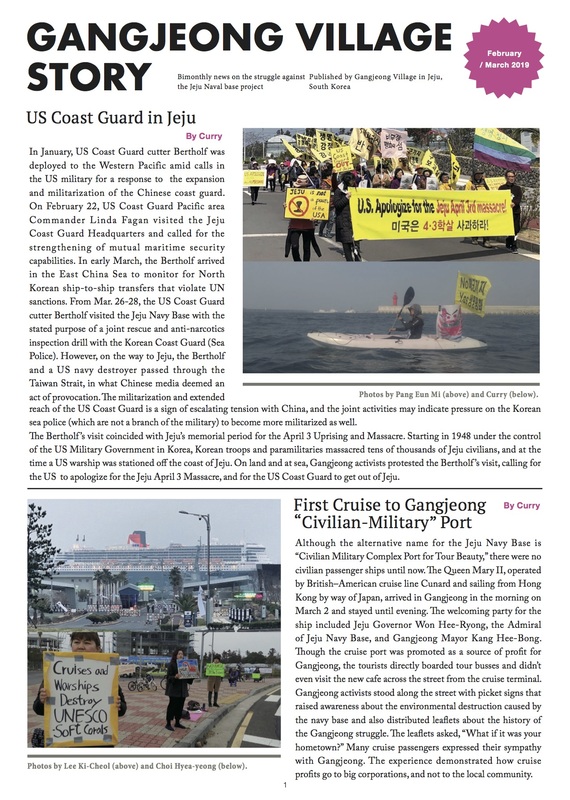 Though it might be a casual proposal, the idea of building an air force base in the Peace Island is dangerous, adding to our concern about the possibility of militarization of Jeju. To see the map, the overlapped area of ADIZs among China, Japan, and Korea could be an interesting area. It depends on the people keenly related to the area whether the overlapped zone, known to be resource-rich area would be the field of conflict or co-existing peace. You can see more maps here.